View of restored second floor, 101 Spring Street, New York, 2013. Photo: Josh White. Art: © Ad Reinhardt; Donald Judd Furniture™ © Judd Foundation. SOME TWENTY YEARS after purchasing 101 Spring Street in November 1968, Donald Judd recalled thinking at the time that “the building should be repaired and basically not changed. It is a nineteenth-century building.” This attitude marked Judd as a collector of architecture, as it were, for he acquired buildings not only to use them but also to draw attention to their historical value and preserve their material and spatial qualities. 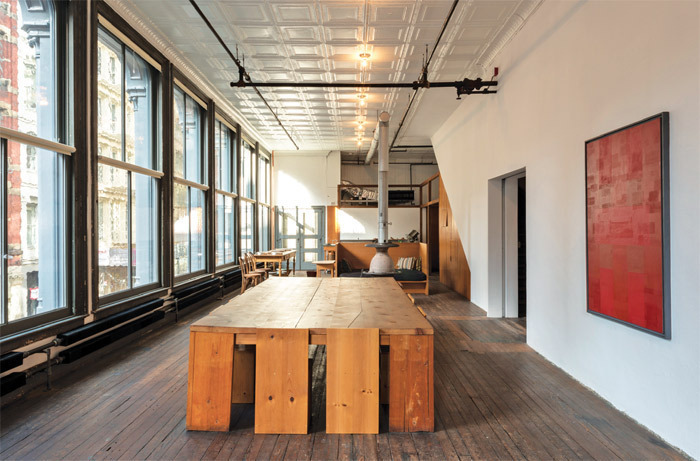 Whether authored designs (such as 101 Spring Street, which was completed by architect Nicholas Whyte in 1870) or vernacular structures (such as the bank building and ranches the artist owned and used in and around Marfa, Texas), Judd selected buildings just as he would collect furniture or artwith the same discerning eye, conceptual nuance, and formal respectand invested in them the same resources, thought, and care.